A brush cutter is a very important tool for use in the garden or backyard. The role of a brush cutter is very important to the survival of your garden. It also helps to keep the landscape looking well kept. It is used to cut weeds, small trees and other plant overgrowth's that are not so easy to reach or get rid of. A Brush cutter machine has more power and can handle tougher plant growth than a Weed string trimmer. Brush cutters normally contain a metal blade which cuts though unwanted or harmful vegetation. The design of the hand operated brush cutter allows for comfortable use. Its length allows for better access to get rid of weeds and other unwanted plants that are hard to reach. Its light weight makes it easy to move around. These can handle larger areas of growth that the hand-held cutters. They are larger in weight and resemble the lawn mower. They can cover a bit more ground in a shorter time and with more ease. These are attached to farm machines such as tractors and are used to complete the largest tasks. The different types of brush cutters are equipped with different kinds of blades. There are chisel, knife, brush destructor, smasher and mulching blades. The most effective of these is the brush destructor blade which can handle the toughest tasks. Your choice depends on the type of work to be done. Brush cutters have many benefits. The most important benefit of brush cutters is that they help to maintain a beautiful yard or garden. 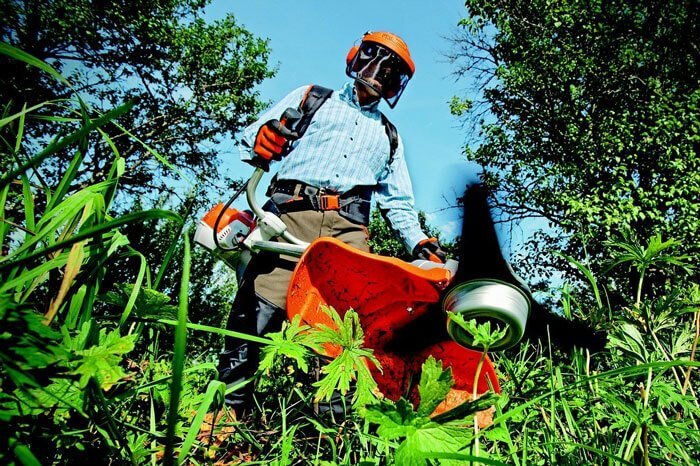 They are effective in clearing and destroying all unwanted thickets or bushes. They are portable which makes them ideal for cutting in difficult, hard to reach terrain. You can also use the machine for longer because of its design. The design allows ease of use so that users can work for a while without causing physical strain. Some brands are also quiet, so you can work without disturbing others. They are easy to store due to their compact sizes. In addition, they are also easy to maintain. Storage and maintenance are two important factors that affect the durability of the brush cutter. There are several factors to consider when purchasing a brush cutter. One important factor is the type and the thickness of the vegetation to be cut down. The difficulty of the task will determine the type of brush cutter you purchase. Another important factor is the terrain you will be using the brush cutter on. The layout of the landscape can cause some plants to be hard to reach. There are brush cutters designed for the hard to reach areas. It is also important to check for the durability of the product. You are making an investment in an equipment that you hope will last for a while. Check the materials the cutter is made from, the design and overall sturdiness. You need a machine that can withstand the tough outdoors. The price of the equipment might be an important factor if you are on a budget. However, do not substitute quality for price. Choose the best available brush cutter that is within your budget. When using a brush cutter, exercise caution and wear protective gear. While using the brush cutter, protect yourself from flying debris. Be sure to protect your eyes. Use brush cutters with a harness and handle bar. These will protect your hands and lessen the impact of accidents. Also remember not to use too close to others since it can cause physical harm. Also look out for those straying animals that may wander into your path. Purchasing a brush cutter is very important to maintain your garden. It ensures that your garden is properly cleared for new growth. The role of a brush cutter cannot be over stated. Take proper care of the brush cutter for a durable and effective machine. Pay special attention to the blade which needs to be kept sharp and clean. The brush cutter is a useful equipment that must be handled with care. Read the manual before use to ensure you understand how to care for and operate the equipment. Hi! I'm Eric Parker, Author of Tools Freak, a craft handyman with the passion for DIY projects and obsessed with home improvement tools and equipment. I share the DIY experience I have and the best tools you need.